A view of football through Swansea City tinted glasses. Over the past few weeks, work has finally begun on demolishing Swansea City’s former home. 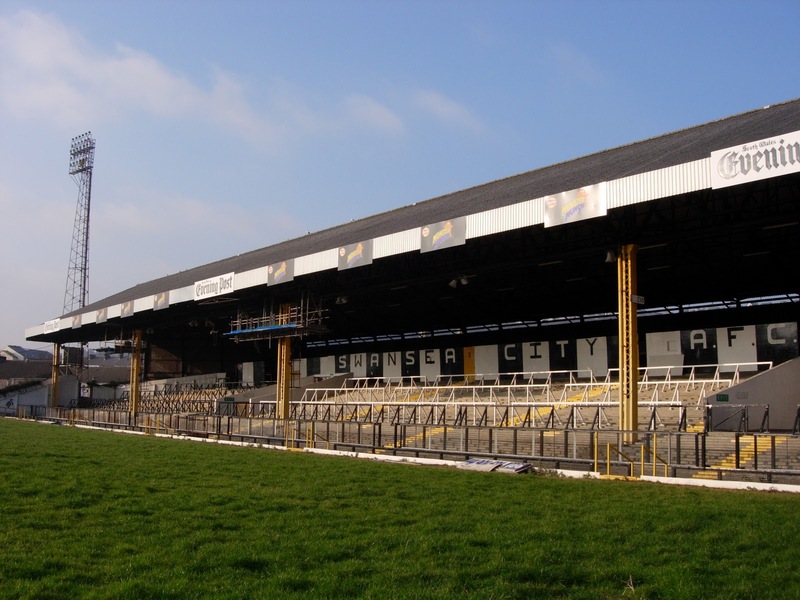 The drawn out saga surrounding the use of the land is not of any real interest to me and most Swansea supporters, the only concern is how this wonderful old ground has been treated. For more than five years it has stood idle, awaiting its inevitable fate. This three month dismantling period will be wrenching for me and every other Swansea supporter. My first visit to The Vetch Field came at the age of six for a League Cup match against Port Vale during the mid nineties. It was a Tuesday night match on a fairly normal Swansea night, which meant rain and wind battering the coast and nearly all those at the ground. Despite the weather and dilapidated state of the stadium, that night I was bitten by not only the bug for watching live football but more importantly for the ground, the atmosphere and something which is not too often associated with football, the humour. Following that taster, my next match was a home match against Cardiff. I can’t help but think that having this kind of derby experience so early on really helped to cement my instant taking to the whole experience! I'm not often able to vividly recall events from my childhood if I'm honest, but I remember every early visit nearly perfectly. Looking around the North Bank during these matches I couldn't help but think, “does the noise ever stop?” The singing, sights, sounds and more than anything, passion I felt from those around me was something I’d certainly not seen before as a child and definitely not found since, despite searching for it everywhere. I think I knew from very early on my association with the ground would be a long one. In the fifteen or so years of going to any game that I could, I saw promotions, relegation, titles and even a cup final win. The ground was situated less than two minutes walk from Swansea City centre and consisted of four completely separate and bizarrely different stands from that each told a story from various eras in the club’s history. The North Bank was the terraced main stand holding the bulk of the support, in both the numeral and vocal sense and The East Stand was redeveloped in the 1970’s into the most unusual double tiered stand. The centre stand was the oldest and smallest stand while the West stand housed the away support and was a conversion from the old two tiered wooden stand that it had been before safety regulations forced the change. The East Stand - note the floodlight! It’s difficult to explain just why you fall in love with a football ground, just what it is that makes it a home for the fans or what makes some just a place where a team plays football. Most clubs outside of the largest five or six in England and Wales are locally based and the more grounds I have visited and the more fans I have spoken to, the more I believe it has to do with the sense of community that you can feel more intensely than in any other walk of life. What we had at The Vetch was not only an arena for the Swansea community to congregate, but somewhere to belong, enjoy ourselves, compete with the opposition vocally and on the pitch and most importantly to vocally express our Welsh passion. 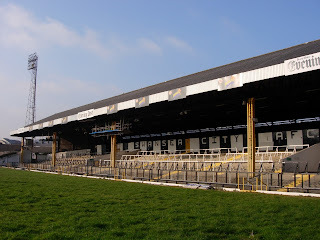 The characteristics that I fell in love with at The Vetch Field are all so lacking in new stadia, including The Liberty Stadium, Swansea’s new home. Of course there are benefits, such as better facilities and views of the playing area, but frankly, I’d take the inadequate facilities and restricted views every day. I can honestly and happily say that none of these would have had me returning to the ground each and every week and owning a season ticket for 10 seasons straight. Football is nothing without a crowd there to make it worth watching and The Vetch was one of the most character filled and atmospheric places in which I’ve ever experienced not just football but any crowd at all. After seeing most of my beloved North Bank disappear in just one week, the one thought that keeps swimming around my head is that despite the benefits of having a new ground, it feels like a massive mistake to have left a club’s spiritual home. It kills me to think that Swansea's new generations of fans in years to come will have to watch games sitting in near silence in a bland, characterless concrete bowl. I’d give anything to go back but the truth is that we have to concentrate on making the Liberty Stadium a real home. Used to supporting a failing Swansea side...the Premier League is a whole new experience.